The new ULTHERA machine using high intensity focused ultrasound or HIFU for TISSUE TIGHTENING has arrived on our shores and of course, I voluntered to give it a try. I was the perfect candidate for it being 40-something with a little sag in the jowls and due for my second Thermage treatment this year. No fear felt, thinking it would be like a Thermage session with heat, the technician started with my under chin and jawline area. The sensation felt like little pins and needles scratching on my skin but overall it was pretty tolerable. Then we tried on some patients, and it turned out they felt more comfortable with Ultherapy then some of the other skin tightening modalities. 1 patient even fell asleep! Both patients felt they could see the effect on their lower face immediately. Now this is amazing as lower facial sagging and laxity is one of the most difficult problems to treat. Many treatments before this including Thermage still could not tackle this area very satisfactorily. So my interest in this new technology and treatment called ULTHERAPY is piqued. We have conducted several Ulthera treatments since then and I must say, the results are pretty impressive. Most of our patients who underwent it saw the "lift" effect immediately after! The treatment was also tolerable and not very painful to them. 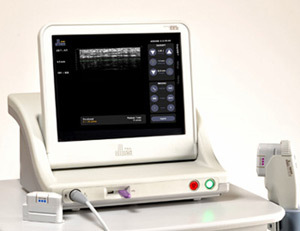 In fact I think less people cringe at the discomfort then I see with mono polar RadioFrequency . Best for those above 35yrs old wanting to arrest the effects of gravity's downward pull and strenghten skin against sagging, this NO DOWNTIME procedure works on the deeper layer of facial skin which is the layer that holds everything UP! I was also interviewed on the Bella show about skin aging and Ultherapy. It's been almost 3months since my Ulthera treatment. First there was pain, then 4 weeks of soreness and numbness and now....I think my jowls are less and my slightly saggy chin skin is almost disspaeared. This equipment seems to give better results then thermage. If only we could do something about the pain during treatment, it would be wonderful. Hi Doc, how much would treatment cost for eyelid lift with Ulthera? For prices and charges, please contact En-Hanze Aethetics Centre at 1300-88-1788. Ultheraphy Skin Treatment is onae of good method for skin tratment. I think now this method become more popular than several years ago. Ultherapy is currently one of the more popular treatments for non-surgical, no downtime skin lifting and tightening treatments available worldwide.